It wasn’t the first time my appetite was cued from watching CNN’s “Parts Unknown,” a culinary travel series hosted by celebrity chef Anthony Bourdain. 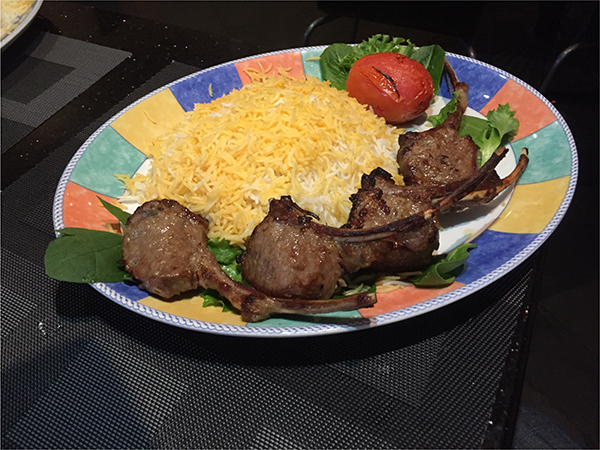 The show has sent me running in the past to the nearest kitchens serving Thai dumplings, Brazilian meat skewers, and more recently, to some of the most tastefully prepared Persian food San Diego has to offer — at Bandar in the Gaslamp Quarter. Just as Bourdain spotlighted while eating his way through Tehran, the gently spiced meals at Bandar are served in generous portions and feature everything from gorgeous lamb dishes and mouthwatering shish kabobs to exotic stews and saffron-kissed basmati rice that’s so featherlike, a gentle breeze can nudge it off your plate. Bandar, which translates to “port,” also reflects the heartfelt hospitality Bourdain encountered in Iranian households and restaurants. Here, the staff is equally eager to feed you the specialties of chef-owner Behrooz Farahani, an Iranian who emigrated to the U.S. in 1988 as an architect harboring a desire to cook for people. 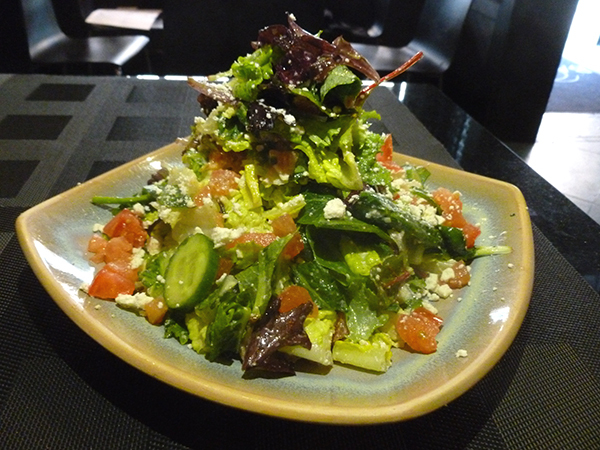 Visit for lunch, and a shareable complimentary salad dressed simply in lemon juice and olive oil arrives to your table ahead of the entrees. Speckled with feta cheese, the appeal doubles when rolling some of the salad into a piece of house-made lavash bread always included with lunch or dinner. The endearingly soft-spoken Farahani opened Bandar in 1996 a few doors down, before eventually moving to his current location, which shows off two dining rooms he designed with a good deal of finesse for presenting his native cuisine. The main room is loungy with overhead lights artistically encircled by tiny metal chains. A wavy ceiling further back cascades gracefully over the bar. In the adjoining dining area, named The Olive Room after its color scheme, Persian appointments mix gracefully with a wall of accolades earned over the years from Zagat and various media. 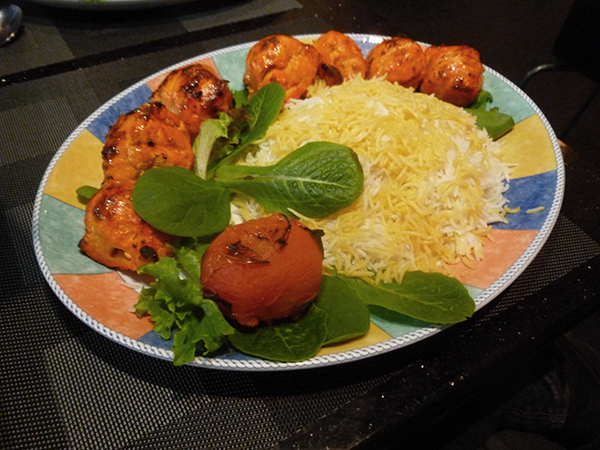 Not surprising, Bandar’s “world famous chicken” entrée is cited in nearly every review. Farahani weaves boneless, skinless breast strips into sizable balls and then marinates them overnight in onions, olive oil, fresh lemon juice, saffron, and a little salt and pepper. They’re charbroiled upon order, and what you get are eight orange-tinted orbs of juicy chicken more elegantly flavored and prettier on the eyes than any white poultry meat you’ll find anywhere. The marinated French-cut lamb chops my companion chose wowed us as well. Served also with a heap of basmati rice and a succulent grilled tomato, all four chops required only a lazy push of the knife for extracting the earthy, seared flesh from the bones. Both proteins appear in a number of other dishes such as Iran’s popular pomegranate-walnut stew (fesenjan) made with chicken or lamb shank; the albalu polo featuring chicken over black cherry rice; and the baghala polo, which is lamb in light tomato sauce with dill and lima beans that I recall savoring at the old address. 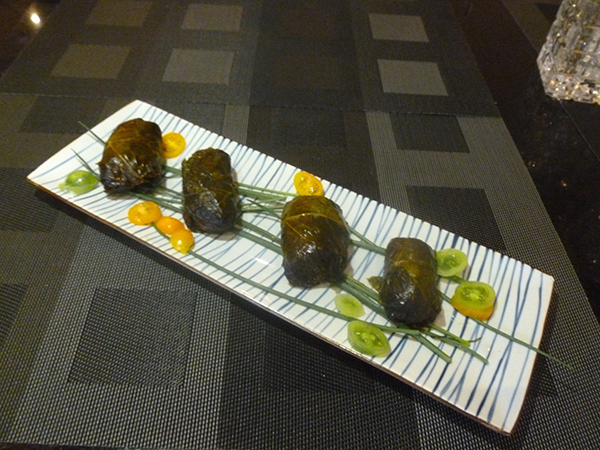 Filet mignon occupies a section of the menu in the form of kabobs or as a full steak. Although when the beef is ground and shaped into strips (koobideh), the price becomes considerably cheaper for an authentic taste of Persian-style beef that’s similar to Lebanese kafta, but better under Farahani’s knack for seasoning meats with such poetic soul. Given the large entrée portions, prepare to take food home if dabbling in appetizers or saving room at the end for dessert. That said, Persian food is lighter and healthier than most, so don’t rule out certain first courses like the shallot dip (must-o mosier), which exposes us to the joyful tang of silky house-made yogurt — or the stuffed grape leaves (dolmeh) packed with split peas, rice and a unique riot of herbs that begin with the subtle licorice flavor of tarragon. These are excellent first courses. 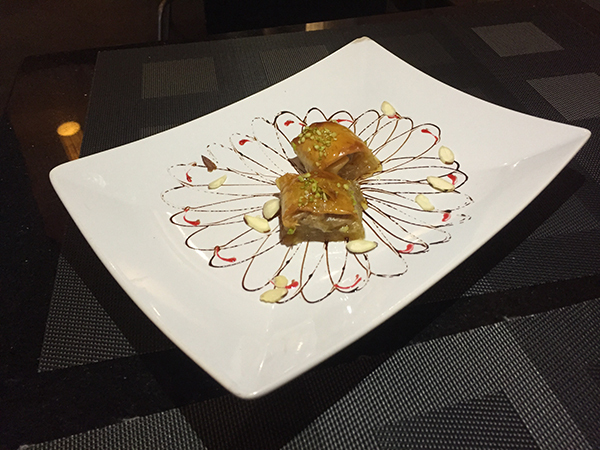 And the baklava is a winner, too, with its dense filling of pistachios and flaky filo pastry moistened with rose water and honey. 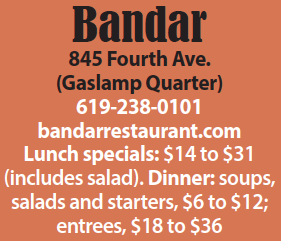 Bandar’s lunch specials are served from 11:30 a.m. – 3 p.m., Monday through Friday. They include the fabulous, aforementioned house salad. Dinner is served nightly until 10 p.m. Sunday through Thursday, and until 11:30 p.m. on Fridays and Saturdays.